HiCap Records » Night of Synthpop at Pop Culture – 5 Bands! Night of Synthpop at Pop Culture – 5 Bands! 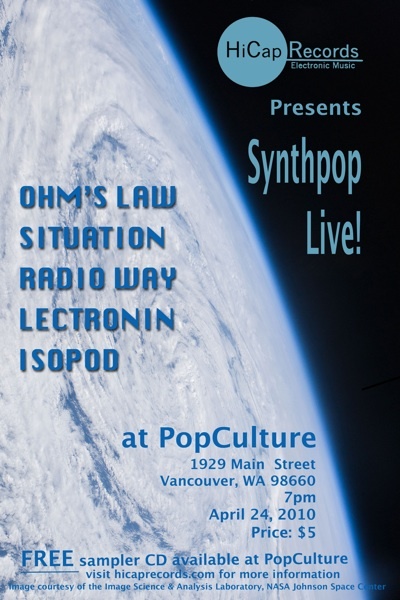 HiCap Records is excited to present Synthpop Live at Pop Culture (1929 Main St., Vancouver, WA 98660) on Saturday, April 24 at 7 PM. There’s going to be five groups performing including usual suspects Radio Way, Isopod, and Lectronin, who will be joined by Ohm’s Law from Southern California, and Situation from New Mexico. We’ll turn any venue into a mini arena concert, and this night will be no exception. Come and listen or come and dance, but make sure you don’t miss this one! And if you want to check out what the bands sound like, just stop by Pop Culture during regular hours anytime before the 24th to pick up your FREE copy of a sampler CD of all five groups. The cost for the show will be $5 at the door.